Mobile Marketing CRM, SMS, WAP - CONTINENT, S.A. Continent Interactive has the following services available to bring our clients closer to their customers, by transforming interactive channels into a factor for growth. Proximity Marketing utilizing bluetooth technology to send material (text, images, videos or voice) to potential customers. 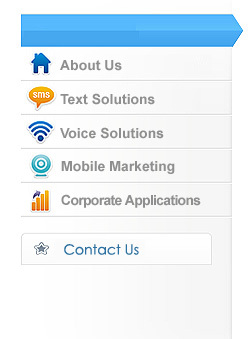 CRM SMS platform by sending messages to potential clients. Design and Development for WAP portals to display your products. Mobile Application Development for Smartphone technologies (Camera, accelerometer, GPS, etc.) to display your products. Multichannel convergence (Voice, SMS, MMS, WAP, E-mail).